France, which side are you on? Macron created new Islamic institutions destined to adapt France to Islam — not to adapt Islam to France. No-go zones are growing rapidly in the suburbs of all of France’s main cities. Shanty towns built by illegal migrants from Africa and the Middle East have sprung up in parts of Marseilles and Paris in the last few years. Islamization is everywhere. In hundreds of mosques, imams deliver fiery anti-Western speeches. Churches are vandalized. The number of rapes is rapidly increasing. Groups of veiled women roam the streets and insult the “immodest”, unveiled, women. French President Emmanuel Macron addresses a joint meeting of the U.S. Congress in Washington, DC on April 25, 2018. Macron’s most important project since he was elected has been the creation of new Islamic institutions destined to adapt France to Islam — not to adapt Islam to France. Many more mosques will be built, financed with taxpayer money; departments of Islamic culture will open in universities, and imam training centers created. Macron’s main advisor on this subject is Hakim El Karoui, the author of a book (“Islam, a French Religion”) explaining that Islam is now the main religion in the country; that prejudices of non-Muslims are the source of most troubles, and that helping Muslims to have access to more important positions in French society is of the utmost urgency. Sadly, it will also be difficult for President Macron, Prime Minister May and Chancellor Merkel to hide that they are appeasers of Islam and the weak commanders of countries they are allowing to decay. During his recent State visit in Washington, French President Emmanuel Macron spoke of the “long friendship” between France and the United States, and tried to present himself as a reliable ally. His statements, essentially empty words, should be taken with extreme caution. Today in France, repeated strikes in the public transportation systems degradeeconomic activity and create an atmosphere of permanent unrest. Riots are frequent and every protest now ends with dozens of cars burned and many shops ransacked. Terrorist attacks continue to take place: 250 people killed in the last six years, more than in any other European country. No-go zones are growing rapidly in the suburbs of all main cities. Shanty towns built by illegal migrants from Africa and the Middle East have sprung up in parts of Marseilles and Paris in the last few years. Islamization is everywhere. In hundreds of mosques, imams delivery fiery anti-Western speeches. Churches are vandalized. The number of rapes is rapidly increasing. Groups of veiled women roam the streets and insult the “immodest”, unveiled, women. Jews by the thousand hideor flee the country. The government appears to have lost all hope of restoring order; it limits itself to trying to avoid the worst, without even being sure it can. A climate of creeping submission holds sway. The corrosion that eats away at the country is never identified and, unhindered, continues its devastation. When asked recently what was France’s main problem, French Secretary of the Interior Gérard Collomb spoke of the feeling of “exclusion” among many “youths”. He said the solution was “social projects” — billions of euros more will be spent. Collomb did not say that hundreds of millions of euros have already been lavished on “social projects” with nothing to show for the expense. French Prime Minister Edouard Philippe spoke of the need to create “deradicalization” centers, where instructors will explain that Islam is supposedly compatible with the “values of the republic”. He did not mention that “deradicalization” centers were created years ago and had less than no effect. Macron’s most important project has been the creation of new Islamic institutions, apparently to adapt France to Islam — not to adapt Islam to France. Many more mosques will be built, financed with taxpayer money; departments of Islamic culture will open in universities, and imam training centers created. His main advisor on this subject is Hakim El Karoui, the author of a book(L’islam, une religion française; “Islam, a French Religion”) explaining that Islam is now the main religion in the country; that prejudices of non-Muslims are the source of most troubles, and that helping Muslims to have access to more important positions in French society is of the utmost urgency. Organizations subsidized by the government and the European Union track down any sign of disrespect for the Muslim faith. The bullying works. Journalists and writers who criticize Islam are prosecuted and cast aside. Sometimes, some of them publish a petition to try to make their voices heard despite the quashing and censorship. Most often, they arouse only indifference, or the anger of a few judges. Once in a while, they manage to create a brief scandal out of it. A text published in a Parisian daily not long ago spoke of an “Islamic anti-Semitism” and “ethnic cleansing” that were chasing Christians and Jews out of many areas. Three hundred people signed the text. Those who wrote it, carefully did not mention Islam itself, but “Islamist radicalism” instead. It became immediately clear that they had gone way too far. Dalil Boubakeur, rector of the Great Mosque of Paris, said that the text was “insane” and vile. Amar Lasfar, president of “Muslims of France” (the French branch of the Muslim Brotherhood), added that the authors of the text were “maleficent ignoramuses” who had insulted all Muslims. Intellectuals on the left (many of them Jews) published an article saying that “Islam is not guilty”, and that those who do accuse Islam create the risk of civil war. Silence quickly returned. Pluralism has almost completely disappeared. President Macron’s popularity is fading, but the country’s political parties are in ruins. The population seems to have lost all reference points; no leader embodies a vision likely to bring improvements. A Marxist left, still dreaming of a “proletarian revolution”, persists in conflict with an extreme right mired in failed socialist ideas. Those include increased spending on public services and calls for more “social justice”. The moderate right has not recovered since its disastrous defeat in last year’s elections. For the first time under the Fifth Republic, the moderate right was eliminated in the first round of the presidential election; it is still disintegrating. The pervasive decomposition of the country and the exhausted leadership of those who are supposed to rule has affected foreign policy as well. France contributed to the destruction of the Islamic State in Syria, but when French leaders spoke about it, including Macron, they rushed to deny the existence of an enemy. Instead, they used the Arabic acronym Daesh for the Islamic State in Iraq and Syria (ISIS) — and emphasized that Daesh was not Muslim, but supposedly just the embodiment of a strange “ideology”. The participation of the French military in the recent limited bombing of chemical weapons facilities in Syria was unanimously criticized by French politicians, who said that France should not behave like a “poodle of the United States” and bomb a “sovereign nation”. Macron said it was a one-time action and would not happen again. In Washington, Macron denounced terrorism in general, but avoided the words “Islamic terrorism”. When he spoke to students, he did not hide the existence of hatred towards the Jews in France, but attributed it only to the far right. In his speech to Congress, Macron weirdly said that terrorist attacks are “the price we pay for freedom”. He added that he wants France to contribute to a “sustainable peace in a united Syria”. He never said that the country has been totally devastated, emptied of half of its population, and under the control of Russia and Iran, which are busy populating the place with military bases. Macron also said, in the face of all evidence to the contrary, that with some adjustments, the Iran nuclear agreement could prevent Iran from building nuclear weapons. Israeli Prime Minister Benjamin Netanyahu showed the world documents proving that Iran had not stopped its secret nuclear weapons program. Macron still did not modify his position. He published a statement enumerating “steps taken towards an enlarged agreement on the surveillance of Iran’s nuclear activity”. He added that the deal is necessary to “ensure regional stability and avoid escalation”. It was a way of saying that France preferred to keep the agreement and that it oddly considered the region stable. Macron remained silent during the popular unrest in Iran in December 2017. He contented himself with postponing the official visit he was supposed to make in 2018. He never said that France has close business ties with Iran, and concrete interests in new sanctions against Iran not being adopted. French businesses such as car makers Renault and PSA operate large factories in Iran. A year ago, the French oil company Total and the National Iranian Oil Company signed a contract for the development and production of South Pars, the world’s largest gas field. France is offering euro-denominated credits to Iranian buyers of its goods to bolster trade while trying to keep the offer outside the reach of possible new U.S. sanctions. For more than four decades, France never stopped supporting — politically and financially — the “Palestinian cause”. All politicians know that the presence of millions of Muslims in France, the intimidating weight of Islam in the country and a hegemonic spirit of submission could make any position favorable to Israel lead to nationwide mayhem. Macron is no exception. Every time there is a terrorist attack in Israel, the French government speaks of a “cycle of violence” that has to stop, and warns Israel not to react “disproportionately“. A press release mentions that the Palestinian people have the “right to a state”. For more than a month, the Islamic terrorist movement Hamas has been organizing marches to cross from Gaza into Israel, using force. Hamas knows perfectly well that the Israel Defense Force will protect its country and that invaders will be shot. Hamas terrorists hide behind civilians, using them as human shields. America’s ambassador to the UN, Nikki Haley, asked Hamas to stop “using people as cannon fodder”. France reacted as if Hamas were not involved. It urged Israel to “show restraint” and to respect the “Palestinians’ right peacefully to protest”. So far, 200 acres of Israeli farmland has been destroyed by “peaceful” Palestinian fire-kites. In December 2017, a few hours after President Trump announced his decision to move America’s embassy in Israel to Jerusalem, an official statement by the French government announced that the French embassy in Israel will remain in Tel Aviv, and that “East Jerusalem” must be the capital of the future “Palestinian State”. Macron called Turkish President Recep Tayyip Erdogan; together they decided to try to persuade President Trump to reconsider his decision. Since then, Macron has stipulated that President Trump’s decision supposedly “goes against international law” and that the United States has lost its position of “honest broker” in the Middle East. In fact, the embassy move does not “go against international law”. When Prime Minister Benjamin Netanyahu was in Paris, in December, 2017, Macron told him undiplomatically that Israel must stop the “colonization of the Palestinian territories”. A few months earlier, Macron had welcomed Mahmoud Abbas to Paris and emphasized that France “knows” Abbas’s “constant commitment” to peace and “non-violence”. He kissed Mahmoud Abbas as warmly as he kissed Donald Trump at the White House. He did not react to Abbas’s most recent anti-Semitic rant. When Abbas has praised the murderers of Jews, Macron never said anything. An American delegation of 250 people will come to Jerusalem on May 14 to inaugurate the American Embassy. No official representative of France will be present. France is boycotting the ceremony. At the end of his revelations about Iran’s nuclear projects, Israel’s Prime Minister Netanyahu said he believed that President Trump would “do the right thing“. On May 8, President Trump announced his decision to withdraw from the Iran nuclear agreement and restore sanctions on Iran. Iran’s President Hassan Rouhani replied that “Iranian uranium enrichment may resume”, and that Iran will now negotiate with countries remaining in the agreement. Macron said that he “regrets” President Trump’s decision, and added illogically that “the international fight against nuclear proliferation is at stake”. He recently spoke of a “risk of war”, overlooking that Iran is already at war in much of Middle East — Iraq, Syria, Yemen and Lebanon — and even with its own citizens. 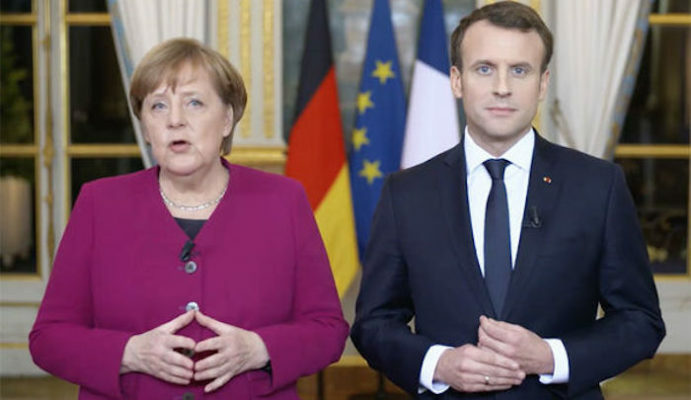 In a joint statement, Macron, German Chancellor Angela Merkel and British Prime Minister Theresa May spoke of their “continuing commitment” to the deal, and added that Iran “meets its own obligations under the deal”. They overlooked that these “obligations” were minimal, to say the least. It will be difficult for Macron to repeat that he is an ally of the United States, or that he is reliable. Sadly, it will also be difficult for Macron, May and Merkel to hide that they are appeasers of Islam and the weak commanders of countries they are allowing to decay. All these leaders know the truth about islam. So deceitful. France is a ZOG, a member of EUssr, a member of NATO and tributary to ZOG.fedgov.usa. As the new embassy of ZOG.fedgov.usa is opened in Jerusalem watch these disgusting shabgoy ZOGbots grovel before their Jewish Masters – that would be the so called (((Deep State))) back in the USofA. Sure, Lynda! France is allowing islam to take it over because the evil Jooz (whom the Qur’an says allah hates the most!) are telling it to. Makes perfect sense – in an asylum! Talk about dumb and dumber!